In winter we can meet Ural owls even in daytime – at road verges or forest clearings we can spot them sitting on tree stumps. 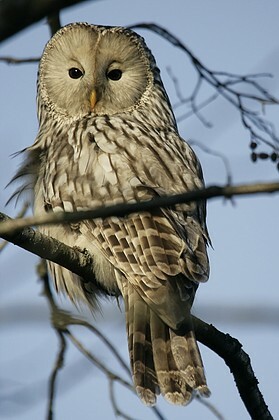 The plumage of the Ural owl is similar throughout the year. Who has once identified it will recognize it in a moment. There are probably about a couple of thousand breeding pairs of our most common owl; the eggs should be in the nest already in about a month as with tawny owls. Only the Ural owl females incubate. The body length of the rather chunky birds is around 60 centimetres. Males are slightly smaller, weighing about 700 grams whereas the females weigh almost a kilo. Back plumage is brown, chest grey and speckled. The large round facial disks around the eyes are uniformly grey; the colour of the eyes dark, the lower side of the yellow beak gray. The tail is long and wedge-shaped.